Bitcoin tops $6,000 — er, now $6,400. Does crypto need to slow its roll? The moving target of Trump’s tax plan… the uncanny logic of Big Government’s antiquated technology… a one-day winner (for 51% gains)… and more! OK, maybe this whole cryptocurrency thing is starting to get a little ahead of itself. Bloomberg tells the story of a small-cap British internet and information company that’s been around for 20 years… whose stock suddenly quintupled in value on Friday. Nor is this a first: Earlier this month, Bloomberg tells us, an outfit in Colorado called “Bioptix” changed its name to “Riot Blockchain”… and nearly doubled in value over the span of a few days. 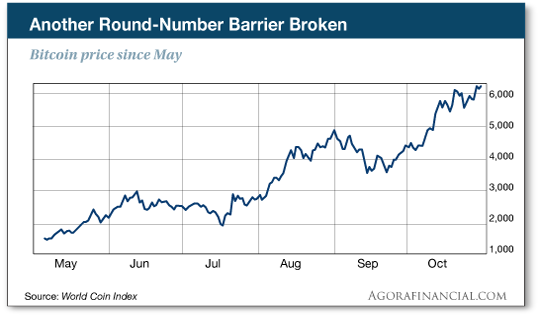 Whew… It was earlier this month the $5,000 barrier fell. No obvious reason for this latest move, although rumors abound that the Chinese government is about to ease up on its recent crypto crackdown. “Yes, cryptocurrencies are in a major bubble,” affirms James Altucher. “But don’t let that word scare you away. “Crypto opportunities are never going away, and generational wealth will be made. James sees crypto as the next stage in the evolution of currency. “Easily transportable, zero transaction fees, no human intervention between payer and payee, high anonymity and strong functionality. This just in as we’re assembling today’s episode of The 5: The world’s biggest operator of financial exchanges wants to introduce bitcoin futures. Bitcoin is now over $6,400. OK, before we were interrupted, James was telling us how crypto is the natural evolution of money. “Another problem is that everyone can “see” the transaction on what is called the blockchain. They can’t see who made it, but they can see the size and other details. “The good news,” James goes on, “is these are problems that can be eliminated. We wrap up our crypto musings today where we began them, harking back nearly 20 years: “Many were burned with similar bubbles like the dot-com boom type in the ’90s,” James says. “My goal is to make sure you don’t get burned again.” Follow this link for James’ full invitation. To the more conventional markets… where traders are again keeping an eye on events in Washington. For the moment, traders have shrugged off any worries noted here yesterday about corporate tax reform. The major U.S. indexes are all in the green, although none of them have fully recovered yesterday’s losses. Meanwhile, it appears the worst-kept secret in Washington is that the president will nominate Jerome Powell as the new chairman of the Federal Reserve on Thursday. Powell has been a Fed governor since 2005. He is not the “disruptive” pick that our Jim Rickards was anticipating. Indeed, the hallmark of a Powell term is likely to be continuity. “He’s Yellen… without the Yellen,” Jim tweets. In other words, we’re still looking at epic-low interest rates — even if they’re not quite as low as a year or two ago. Savers and money managers are pressuring banks to raise interest rates on savings accounts… and with the economy what it is, why shouldn’t banks start shelling out better returns? Here’s the wrinkle to these rising-but-still-pitiful interest rates: “Wall Street wealth managers are a big force behind the banks increasing deposit rates,” Zach tells us. But the way Zach sees it, that just adds up to more opportunity for everyday investors looking to grow their income. “If dividend stocks pull back, you’ll have an opportunity to buy more of our quality stocks at discount prices. Zach compared his Lifetime Income Report portfolio with what the bank has to offer by way of wealth-building: Of 35 positions, 32 are profitable and only three are currently at a loss… that’s a 90% success rate. For access to all of Zach’s dividend-paying recommendations — and a copy of his Big Book of Income — check this out. “Posturing about the tax plan without knowing what’s in it has the odor of Nancy Pelosi,” a reader writes after yesterday’s episode. “But one thing can be said already with certainty — the Tax Policy Center graph you displayed is bogus! “First, it doesn’t specify if it applies to single earners or families. Second, show me anyone earning less than $50,000 who doesn’t benefit from the knowable part of the plan, i.e., $12,000 tax-free and 12%, period. I really am curious who the 23% they cite are. And yes, we’re well aware the income taxes paid by companies are ultimately borne by the customers of those companies. We’re not posturing. We’re just keeping our lips away from the Kool-Aid about how this plan is supposed to be the most awesome thing ever for the middle class and for the economy. “… but given that the IRS is using that antediluvian Individual Master File, isn’t this part of the perverse logic (which only an organization that would hire the likes of a Lois Lerner might think of) that the IRS might use for security? “I mean, what kid worth his salt would even know how to break into this? Hacking into this would be similar to a hardened gang member needing to earn his stripes by stealing a car and showing up back at gang central HQ with a Yugo. “Similar to how I understand with our ICBMs they are still using 8-inch floppies. The 5: A few years after Sept. 11, FBI agents were still taking down tips by hand using triplicate carbon paper. And the Pentagon has blown yet another deadline to be audit-ready — owing to hundreds of antiquated and error-prone record-keeping systems, most of them incapable of interacting with each other. P.S. That was fast: Yesterday, Alan Knuckman urged his Weekly Wealth Alert readers to buy call options on Wells Fargo. This morning, he urged them to sell half the position for a 51% gain… and sit tight with the rest for even bigger profits by the end of next week. Don’t feel bad if you missed out: You could be in a position to reel in the same kind of gains by this time next week. See for yourself.